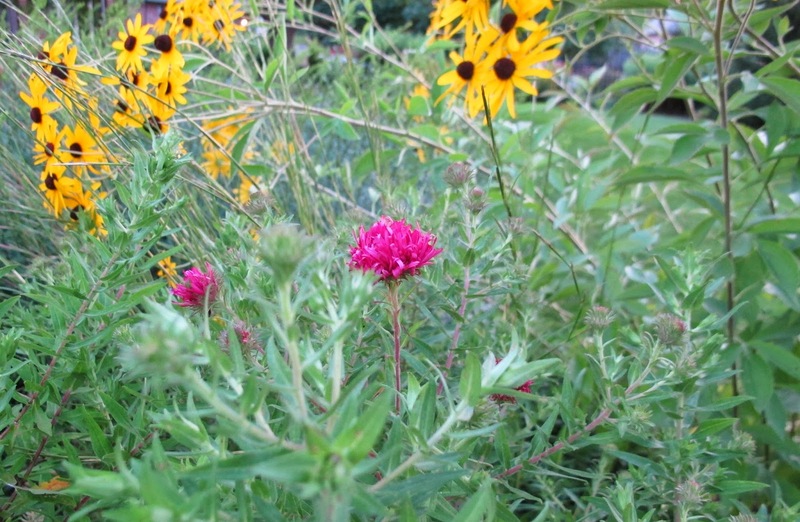 Welcome to Garden Bloggers' Bloom Day for August 2014. 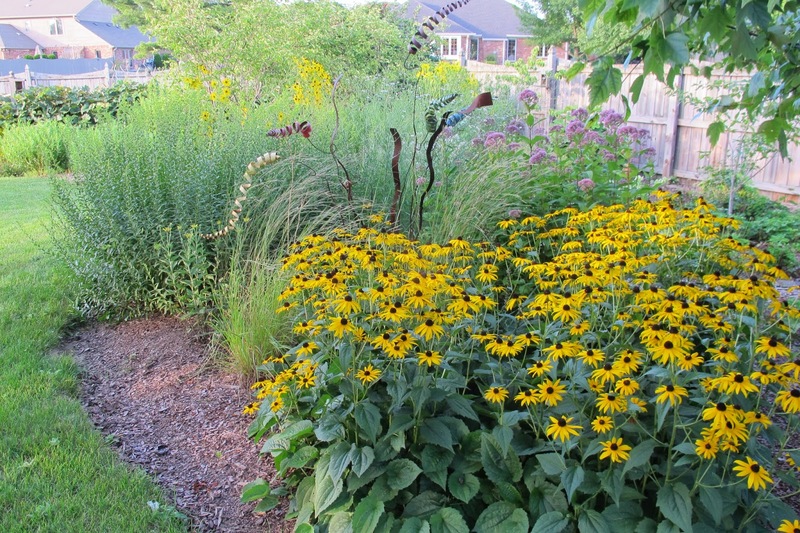 Here in my USDA Hardiness Zone 6a garden in Indiana, I am thrilled with this summer we've been having. I don't mean to brag or make anyone with weather woes cry or gnash their teeth or throw down their own gardening hoe in disgust, but this has been one of the nicest summers in my memory. We've had rain when we needed it, for the most part, and I can't remember any particular days or stretches of days when it was too hot. In fact, out in the vegetable garden, I think the peppers would like it to be a bit hotter and drier. But the rest of the garden isn't complaining. Really, it's been a good growing season. I barely remember our record breaking terrible winter. Now, I could give you a twirl around the entire garden, starting with the Clematis 'Rooguchi' still blooming as it runs at ground level across one section of Plopper's Field. See how 'Rooguchi' is completely ignoring the support I am attempting to provide it? Oh well, I'd rather have 'Rooguchi' running through the garden at ground level than have no 'Rooguchi' at all. Yes, I could give you a twirl through the entire garden but I'm going to just focus on the garden border I call August Dreams Garden. We'll see the other flowers another day. August Dreams Garden is a flower border designed and planted to be at the height of bloom in late summer. It's coming along nicely after being planted back in 2011. This is what I see in August Dreams Garden when I come out the back door in the evening to decompress from the day's activities. If you walk around to the other side of the garden, the path side, you'll see touches of white from Tall Phlox, Phlox paniculata 'David'. The big yellow flowers are cup plant, Silphium perfoliatum. It has large leaves and can be a bit of a "my garden, I'm taking over" flower, so I hear. I shall soon be deadheading it to make sure it doesn't go to seed. 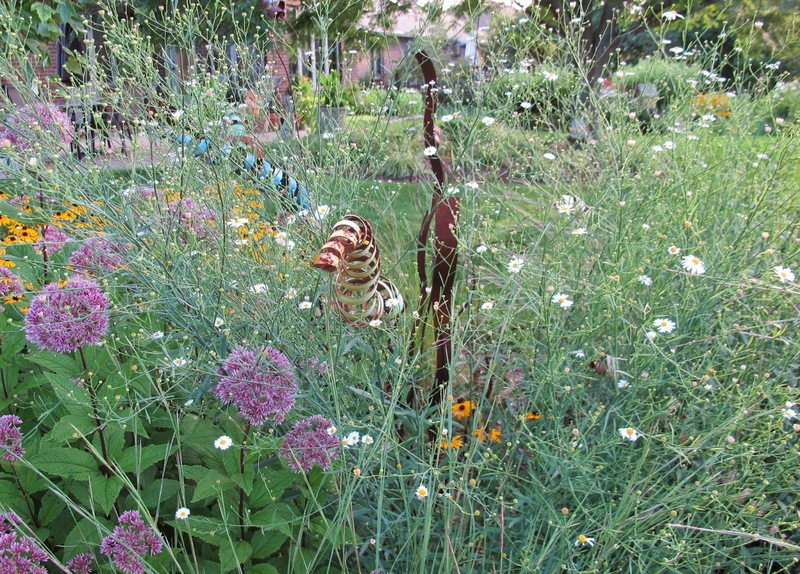 The sculpture in this garden, from Girly Steel, is barely visible this time of year when the Boltonia, Boltonia asteroides 'Snowbank' begins to bloom around it. The rest of the year, the sculpture adds some interest while I dream of what this garden will look like in August. 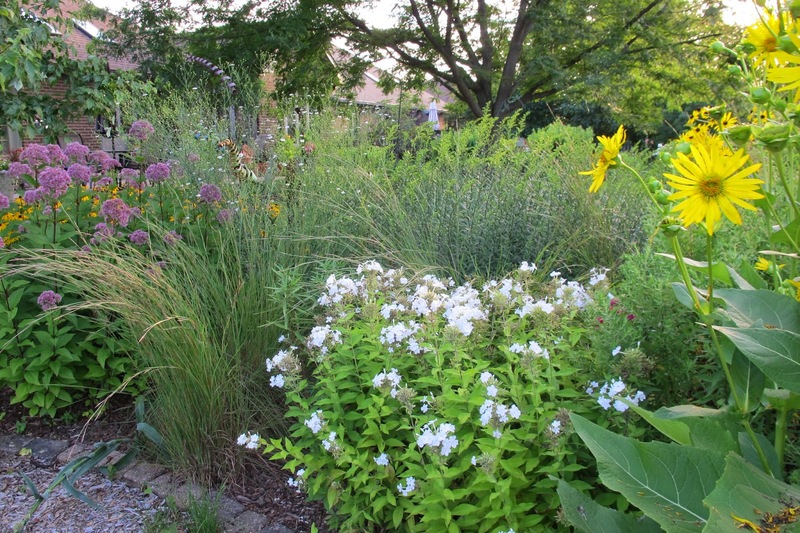 Even though it is mid-August, this garden border is far from finished with its blooms. There are more blooms to come. One of the asters is just beginning to show some color. This is Symphyotrichum novae-angliae 'Andenken an Alma Pötschke', normally sold as 'Alma Potschke'. And once the asters start to bloom, the goldenrod, Solidago shortii 'Solar Cascade' will make its crescendo, drawing pollinators from near and far for a final dance in the garden. When my garden designer and I sat down and reviewed the plans for this area of the garden, she suggested either "daylilies" or a mix of late summer blooming plants. I'm very happy with my choice. I even like the Little Bluestem grass, Schizachyrium scoparium, which grows amidst the flowers, providing a matrix for the forbs, and giving the whole garden a prairie feel. Now this garden border is one of my favorite garden areas here at May Dreams Gardens. It provides new blooms at a time when many gardens are winding down, extending the perpetual spring, first described by Sir Francis Bacon, through early fall. It makes me happy to just stand by this garden border in the early morning before the sun is fully over the horizon, before I leave the garden to tend to life. What's blooming in your garden in August? Please join in for Garden Bloggers' Bloom Day and show us. It's easy to participate. Post on your blog about your blooms on the 15th of the month, then leave a comment below to tell us about your blooms and a link on the Mr. Linky widget so we can find you. If you have any problems with the links or commenting, shoot me an email, and I'll help however I can. Thank you for always hosting GBBD. I have met so many wonderful gardeners through these postings. I'm glad to hear you are having a beautiful summer. Your gardens are beautiful like a painting this August Carol. We have had a similar summer with cooler temperatures and little rain so the gardens are doing well. Thank you as always for hosting Bloom Day! Hi Carol, I had just the same reaction as you in noting what a great summer this has been. It seemed to me just payment for the past winter. Hi Carol, over here in London we have also had an amazing summer, a repeat of last year but not as hot – just perfect really. Your garden looks lovely and having a whole bed for August flowers is a great idea, I might use that in my own garden! We have shared a lovely summer here too. I so enjoyed walking round your August garden and have dreams of making my own here. Starting in September, we are laying the foundations, so I shall be drawing inspiration from your borders. Thank you for hosting this monthly get together. Love the Rudbeckia hirta, what a real splash of colour that is. Your August border is looking fab Carol. I won't complain about the rain in the South West of England.. no, I won't. Happy Bloom Day. Glad to be back... after a few months of missing Bloom Day. Kelli, Northern Ireland. It's been a blissful summer here in PA too, Carol. It's just 50 degrees here this morning: almost a record low for the middle of August. As you said, the peppers aren't thrilled, and some of the tropicals have been a little slow, but I'll take this weather over our usual heat and humidity any day! August Dreams Garden is lovely! I love the idea of having a whole area designed to look it's best at a certain time of year. We're also having a spectacular summer. Here's hoping for a mild winter for us both! I love the August border. What a good idea to have a space dedicated to that time of year when, as you say, things are getting a little tired. We've had a super summer here in the south of the UK, but so early. Right now, it's beginning to feel like September already. Thank you for always hosting GBBD, Carol. I always love to look at flowers from around the world. E. LAWRENCE comments and your garden go hand in hand. We've had pretty great summer weather here too, I think we all earned it after last winter. Your August garden is gorgeous! Thanks for hosting! Carol I remember reading when you planted this garden. Wonderful plants that are blooming here as well except for aster. My goldenrod blooms before my asters. I actually don't recall seeing too many asters, but I need to go find them amongst the crazy wild garden right now. I agree the weather has been nice although a bit cooler here than normal and definitely wetter...3 inches in one day this week. And even with the tomatoes complaining here, they are still producing! I am in total agreement about this summer, Carol--it's been about as perfect as you can get. Perhaps that's our reward for the awful winter we had. What a great idea to have an "August Dreams" gardens--instead of reminiscing about blooms gone by, you can enjoy a whole new array of opening flowers. It's beautiful! Just planted a 'Roguchi' this year, too, and I love these little blooms. Thanks for another Bloom Day! Thank you for hosting this meme again. It is a lovely idea. Your garden is looking wonderful, full of colour. Your August border looks great. Our summer weather has been very nice, too. Good temps but we are lacking rain. Still, no rain means no mosquitoes so working in the garden is very pleasant! Everything looks great in your garden. I have many of the same flowers you have blooming. I have some hostas blooming, unfortunately I don't know the cultivar. They are very fragrant. I have a mum beginning to bloom, also. Your borders look lush and lovely. 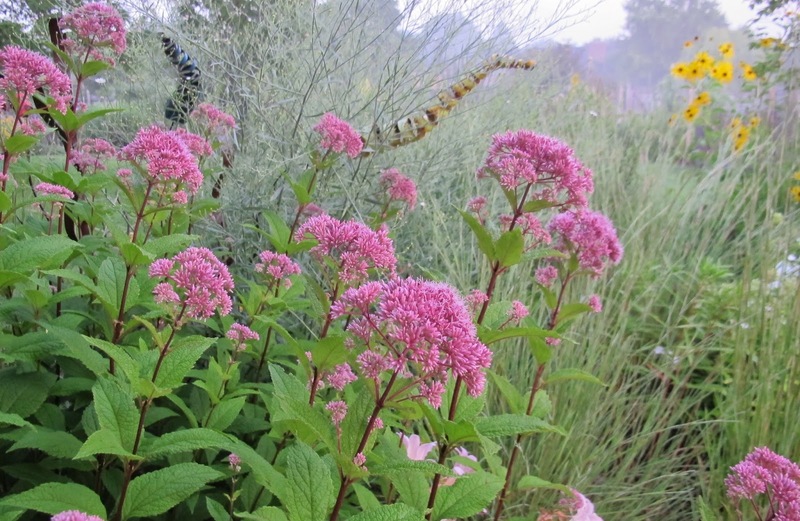 Don't you just adore Eupatorium and the amount of pollinators it attracts? Your garden is stunning. We are as hot and humid as ever but there is plenty to see and the butterflies are finally back. I have trouble with Mr. Linky. I get a message saying 'Missing Op' -- either I've added my link five times or not at all. I suspect I'm not linked. Strange summer here in Virginia, too. No extremes to speak of wrecking havoc on the gardens -- making up for the winter. Are we going to be walloped later? You have so much going on! That clematis is so beautiful--and the rudbeckia and cup plant--both such summer beauties. Thanks for hosting GBD! This is the foremost meme that most bloggers wait for, to 'brag' about their gardens. I am always one of them unless i forget, which today i almost forget again, haha! Thanks again Carol for hosting. A garden that makes you happy every morning you look at it has certainly done its job! Yours is beautiful. Mine, faced with heat and drought, looks a bit bedraggled at this time of year. Thanks, as always, for hosting Bloom Day, Carol! Aren't Black-Eyed Susan's wonderful? Yours are beautiful. I love mine, and I'm making a point to add a few more (along with purple coneflower) this fall. I love your gardens, and the cup flower looks interesting. I might like to try that at some time. What joy our gardens bring us! Thanks for sharing with us and for hosting this Bloom event. So glad to read about your great summer weather, it's deserved. Love your border, that is what I'm trying to produce in the border by the field. I must try harder as it is nowhere as good as yours yet! Sounds like you've had the perfect summer , we've been a bit too dry and hot for my gardens happiness ! Happy GBBD...thanks for hosting it....I love the sweet rain...I see I am not the only one who will take a picture..your garden is beautiful as always. Like you we're enjoying the best summer at Blithewold - knock wood, it hasn't gone over 90! Bliss. Thanks, as always, for hosting GBBD! Happy GBDD Carol and thanks as always for hosting. Glad to read that you have had such a nice summer and hope that what remains continues in the same vein. Your 'August Dreams Garden' shouts out summer. It must be giving your great pleasure. That clematis is a beauty too. I can easily see why that's become one of your favorite garden areas. Gosh, that is so lovely. Love that clematis, and the August Dreams Garden. What a great idea, to have a special bed that peaks around the time that the rest of the garden is fading. I love your August Dreams garden bed, Carol. Such a wealth of high summer shapes and colors! Makes me wish even more that I had the room to create the meadow-y feel you've mastered here. Thanks for hosting. I always enjoy the fairies posts! Keep them coming. Thank you for hosting another Garden Bloggers Bloom Day. I hope the rest of your summer goes well. Hi! Thank you for hosting GBBD. Here in Virginia the weather has been very nice, I'm glad to hear that Indiana has had great weather too! Yes, a wonderful summer, I am trying to treasure it, bottle it up in my brain. 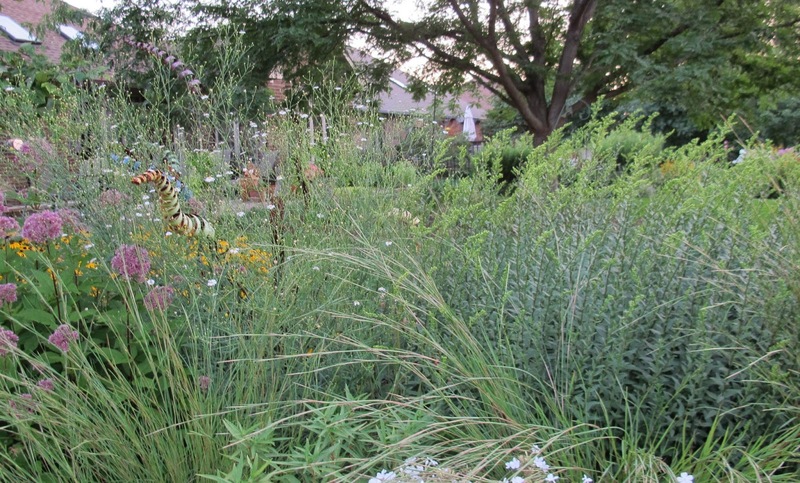 What a gorgeous prairie garden for August! It's been a wonderfully cool summer here in Massachusetts, too. 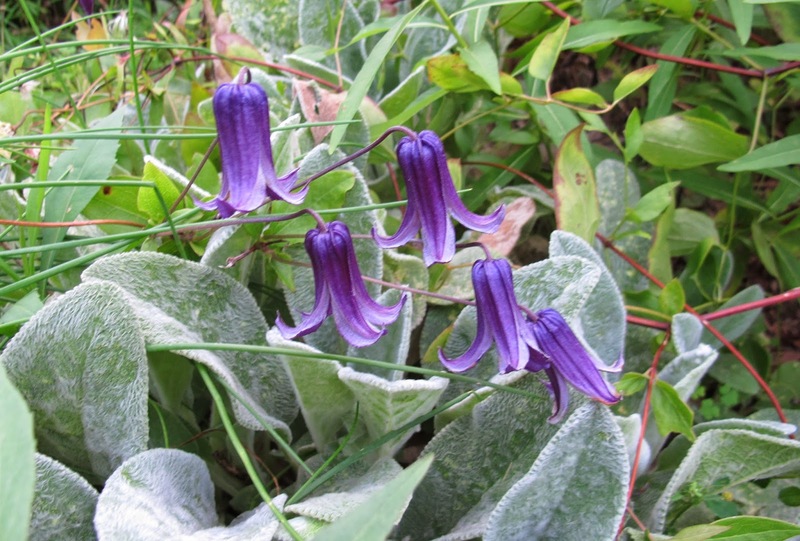 The Rooguchi Clematis is my favorite plant of all time. In fact, it was the plant that turned me into an avid gardener - I saw a picture of it online somewhere and just had to have such a beautiful plant! Sadly, I don't have one yet here in my new garden after the move, but maybe next year. Enjoy! I always learn something from your posts. Thank you. Your August garden is living up to it's name. It is a riot of color that is very pleasing to the eye. I quite agree that we have had a great summer. I think your area has had more rain than we have had but here we have had enough that I don't have to drag the hose around daily watering. Yay! Happy GBBD. Love your post this month! It inspired me to focus my post on the Beds that matter this month. I have to find that 'Alma Potschke'. I am going shopping tomorrow! Your planning paid off well, your beds look lovely at this time too. I enjoy seeing your curvy Rooguchi, it is one that didn't make for me. Your big blocks of color and layered effects are great. You deserve a nice summer after such a bad winter. Late to the party, but thanks for hosting GBBD! Your garden looks spectacular, and I'm happy you are having a fantastic summer without the angst of extreme weather. After a winter like that, you surely deserve it! Love the Little Bluestem...and the Boltonia...just fabulous!